Have You Heard about the Famous Anti-GMO Scientist Who Switched Sides and Is Now Pro? For one thing, he isn’t a scientist at all. This episode has been all over the media. Some commentators have speculated that this will turn the tide in Europe and persuade regulators there to give a full green light to GMO. But let’s take a moment to review the facts. 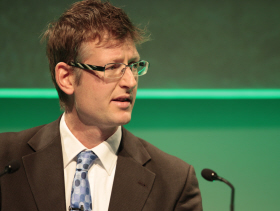 Mark Lynas is not a scientist. He does not even reveal his education on his own website, nor is it easily available on the Web. He is a British author, journalist, and environmental activist with a flair for publicity and a primary focus on climate change. He’s been called a “pioneer” and an “apostle” of the anti-GMO movement, but that is mostly his own self-promotion. At a farming conference in Oxford, England, earlier this month, he gave a speech reversing his previous position on GMO in characteristically dramatic style: “You are more likely to get hit by an asteroid than to get hurt by GM food.” Obviously no scientist would make such a statement given the lack of established facts about GMO. It is precisely the lack of proven facts which are the problem. Lynas added, just to stir the pot further: “More to the point, people have died from choosing organic, but no one has died from eating GM.” Of course he provided no support for that wild claim. Lynas says he was blinded by the anti-GMO rhetoric, that “ the debate is over” and there is a “scientific consensus” in favor of it, which is patently false. He told NPR that he originally came out against GMO without studying it, which we believe. While this may be indicative of his immaturity at the time—this is, after all, the same fellow who threw a cream pie in the face of climate-change-denier Bjorn Lundborg—it may also indicate his ability to be persuaded by whoever is yelling the loudest at the time. “I’d assumed that GM benefited only the big companies. It turned out that billions of dollars of benefits were accruing to farmers needing fewer inputs.” Lynas says GMO benefits small farmers, who rely on and want the seeds. Not true. Farmers in India went into debt to buy GE seeds, hoping for increased yield, and when those crops failed due to pest infestation, they were left more impoverished with no prospects for the future. Farmers were not told that the crops would require twice the amount of water, and that the crops do not produce viable seeds—which means the farmers would have to keep purchasing new seeds. In response, many farmers killed themselves. The rate of Indian farmer suicides began increasing after the introduction of Monsanto’s Bt cotton in 2002, and two-thirds of farmer suicides occur in five Indian states, which has come to be known as India’s “Suicide Belt.” Over 17,000 farmers in India committed suicide in 2009 alone because of Monsanto and GE seeds. Many of the farmers made their suicides a symbolic act by drinking Monsanto’s pesticide. Lynas’s primary argument here is that GMOs will feed the world and increase crop yields. Our extensive article shows that this simply isn’t true. “I’d assumed that it would increase the use of chemicals. It turned out that pest-resistant cotton and maize needed less insecticide.” True about insecticides, but wrong about the rest—insecticides are not the only chemical problem. GMOs have dramatically increased the use of herbicides. Roundup Ready crops have grown resistant to herbicides, creating superweeds that require even more dangerous and toxic herbicides. Lynas calls the regulatory system in Europe burdensome, unnecessarily increasing the cost of GMOs. Not everywhere! Here in the US there is no regulatory system specific to GMOs, turning consumers into human guinea pigs, and concentrating money and power in the hands of few powerful biotech companies, with the USDA rubberstamping GMO deregulation to the benefit of Big Farma. “I’d assumed that GM was dangerous. It turned out that it was safer and more precise than conventional breeding, using mutagenesis for example.” Safer than mutagenesis, a process that involves exposure to radiation and chemicals? Maybe. Safe? Categorically untrue. For someone who says he has come to love the scientific method, this is a remarkably unscientific conclusion, because there have been no long-term human studies supporting the safety of GMOs. What is most notable about the GMO field is the lack of independent, objective, and long-term studies in humans. There have, however, been plenty of animal studies, and here the science is becoming clearer: GMOs may be causing birth defects, high infant mortality rates, fertility problems, and sterility in hamsters, rats, mice, and livestock fed GMO soy and corn, and some hamster pups even began growing hair inside their mouths. Studies indicate other serious health risks as well: immune system dysregulation, with changes in the number of immune response cells showing up in the gut, spleen, and blood—all of which points to an allergenic and inflammatory response to GMOs; increased aging (especially in the liver); dysregulation of genes associated with cholesterol synthesis, insulin regulation, cell signaling, and protein formation; and changes in the liver, kidney, spleen, and gastrointestinal system. The real story here is not Lynas’s antics, from pie-throwing to dramatic recantations. It is the media’s coverage of the latest self-promotional stunt. Cover the stunt if you like, but please do not pretend that this has anything remotely to do with science. Editor’s Note, 1/25/13: In an earlier version of this article, we included an abbreviated quote by Mark Lynas on the safety of GM.